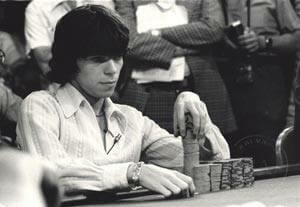 One of the most enigmatic figures in poker history is the late Stu Ungar. The three-time WSOP Champion was a savant when it came to card games, with legendary stories of his abilities at Gin and Poker making Ungar seem almost godlike, with virtually all of his peers agreeing that he was one of the best and ahead of his time. It’s hard to quantify how good Stuey was, or what he was doing that was so different than his fellow poker pros, but his provable track-record alone (Stu Ungar entered 30 $10,000 buy-in tournaments in his career and won 10 of them) is proof that the stories about his skills are likely pretty accurate, and led many modern players to try to figure out the man known as “The Kid”. Thanks to an incredible find by Jess Welman, who uncovered old World Series of Poker audio tapes recorded between 1995 and 2000, we have our first look at the hands Stuey played throughout the final table. Welman’s discovery has since been pored over by some young talented players, including Leggo Poker coach “Clayton” who broke down Stu Ungar’s 1997 WSOP Main Event victory in a recent blog post. Clayton’s consensus was that Ungar was way ahead of his time, incorporating a LAG style while most of the players were still playing Tight/Aggressive. According to the dictated hands, Ungar’s numbers at the final table 33/23, 34/25, and 38/26 during six, five, and four-handed play*. Clayton also determined that Stuey’s pre-flop bet-sizing was far lower (but still high by today’s standards) than the other players. This is the modern poker world’s first glimpse at the godfather of the LAG style of play, and will likely turn Ungar into even more of a cult hero than he already is, basically playing a modern style of poker at least 10 years before it was even considered as a viable winning style! For all of his tournament skills, a quick look at his Hendon Mob statistics will make your head spin, Stuey was considered a cash-game fish, regularly losing in the biggest games as the other pros of the day simply bided their time and waited “The Kid” out. Some have commented that for Stuey it was a patience issue, but perhaps he hadn’t quite perfected the LAG style beyond tournaments where the escalating blinds punish tighter players. *The statistics cited are Ungar’s VPIP (voluntarily put money in the pot pre-flop %) and PFR (pre-flop raising %) which are used today to determine a player’s style, much like tight/aggressive or loose/passive were used in the 1990’s.